An era has ended. Erich Kunzel, 74, Cincinnati's music man for more than 44 years, has died. Orchestra members learned today that Kunzel died this morning at a hospital in Bar Harbor, Maine, near his home on Swan's Island. Information about memorial services was not immediately available. The Pops maestro is survived by his wife of 44 years, Brunhilde. The couple's homes are in Newport, Ky.; Naples, Fla.; and Swan's Island. "The world has lost a musical giant and we have lost a dear friend," said Cincinnati Symphony Orchestra President Trey Devey in a statement released today by the orchestra. 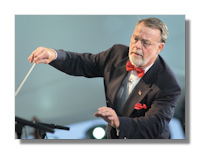 "Erich Kunzel built the Cincinnati Pops into one of the best known orchestras in the world and is not only beloved in Cincinnati, but around the globe. Today we honor his tremendous legacy and offer our deepest sympathies to Brunhilde and their entire family." "I am deeply saddened by the loss of my friend and colleague Erich Kunzel," said Cincinnati Symphony Orchestra Music Director Paavo Järvi in the same statement. "He was a remarkable spirit and a tremendous musician. His many years of music making with the Cincinnati Pops brought joy to literally millions, and I join with our community in Cincinnati as well as his fans around the world in mourning the loss of this great musical icon."